We had a victory yesterday in federal court. The MTA filed a motion to dismiss yesterday. The Judge who ruled in our favor was not amused. And just to show how loaded the dice are against us, the judge, the MTA lawyer and libeler Charles Moerdler, the MTA board member who prefaced his remarks with a vicious tirade of abuse against me during the vote ban, are all friends. Good clubby, cigar, 1%, brandy friends. But the Judge assured us that he would be impartial, and frankly, to date he has been, so I will reserve judgement. Yesterday, the MTA and AFDI lawyer David Yerushalmi argued before Manhattan federal Judge John Koeltl, who ruled in our favor not a week ago. MTA lawyer Peter Sistrom insisted yesterday that the ban against our ads was not against us per se, but against political ads. Nonsense. They never fought the anti-Jewish ads or anti-Israel ads, they only banned only our ads — ads exposing the ideology behind the jihad against Israel and America. There is an expression in yiddish, “auf ein gunaf brentz hittle,” or “on the thief the hat burns.” In other words, “you have a guilty conscience.” And the hot hats over at the MTA are on fire. Judge Koeltl railed against Sistrom for 45 minutes. It was gorgeous. Imagine in post 9/11 NYC, with scores of Islamic attacks thwarted in the subway, the Holland Tunnel, NY Stock Exchange, the Federal Reserve Building, Times Square, etc., and NYC is banning criticism of jihad and sharia. The Ground Zero mosque Imam Rauf was right when he said 9/11 was a watershed moment for Islam. They won. 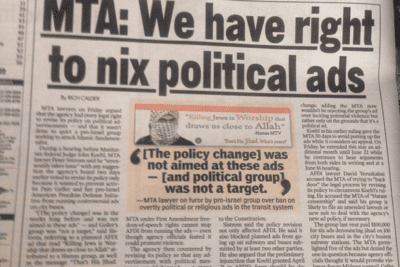 MTA lawyers on Friday argued that the agency had every legal right to revise its policy on political advertisements — and that it wasn’t done to quiet a pro-Israel group seeking to attack Islamic fundamentalist. During a hearing before Manhattan federal Judge John Koeltl, MTA lawyer Peter Sistrom said he “strenuously takes issue” with any suggestion the agency’s board two days earlier voted to revise its policy only because it wanted to prevent activist Pam Geller [sic] and her pro-Israel American Freedom Defense Initiative from running controversial ads on city buses. 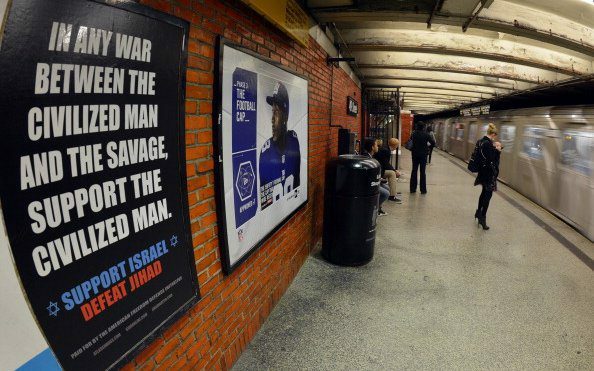 Koeltl last week ruled that the MTA under First Amendment freedom-of-speech rights cannot stop AFDI from running the ads — even though agency officials feared it could promote violence. The agency then countered by revising its policy so that any advertisement with political messages would banned — a move Geller’s group claims is an insult to the Constitution. Sistrom said the policy revision not only affected AFDI. He said it also blocked planned ads from going up on subways and buses submitted by at least two other parties. He also argued that the preliminary injunction that Koeltl granted April 21 in AFDI’s favor should be declared “moot” because of the policy change, adding the MTA now wouldn’t be rejecting the group’s ad over inciting potential violence but rather only on the grounds that it’s a political ad. Koeltl in his earlier ruling gave the MTA 30 days to avoid putting up the ads while it considers an appeal. On Friday, he extended this stay an additional month until June 22 while he continues to hear arguments from both sides in writing and at a June 16 hearing. AFDI lawyer David Yerushalmi accused the MTA of trying to “back door” the legal process by revising its policy to circumvent Koeltl’s ruling. He accused the MTA of “blatant censorship” and said his group is likely to file an amended lawsuit or new suit to deal with the agency’s new ad policy, if necessary. The group last year paid $100,000 for six ads denouncing jihad on 100 city buses and in the city’s busiest subway stations. The MTA green-lighted five of the ads but denied the one in question because agency officials thought it would provoke violence due to Mideast turmoil. Geller sued over the rejection last October.